Granitech is the Engineering division of Fiandre that deals with installations of Ventilated Walls and Raised Floors. Using state-of-the art technologies Granitech develops top quality solutions for important projects in contemporary Architecture. Granitech is the engineering division of GranitiFiandre that deals with installations of ventilated walls and raised floors. Using state-of-the art technologies Granitech develops top quality solutions for important projects in contemporary architecture.This ensure maximum results for the end user from the construction drawings and plans to supply of materials and installation, right through to work completion. GranitiFiandre has set up Granitech, a technical engineering division created for designing and implementing the most suitable project solutions to all kinds of requirements, able to oversee the whole process from the design stage through supply to manufacture and installation, to offer the final user a "Turn-key" service. Ventilated facades and raised floors by Granitech boast utmost functionality and versatily, as proven by the number of works carried out and the importance of the clients who trust its experience. Designed on the "Granitech System", the ventilated facade uses special anchoring systems and ventilated walls' accessories, structures of significant importance for supporting the covering, which, thanks to its unique appearance, is able to provide a strong visual impact. 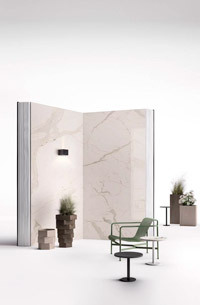 In the same way the raised floor enables the use of endless options of panels and structures to support GranitiFiandre's porcelain tiles, which are the main component of a raised floor. GranitiFiandre materials in fact, manage to combine exceptional aesthetic and technical features, offering unique performance levels of hardness, imperviousness, frostproofness, resistance to wear and tear and chemical aggression. When combined with marble, stone and granite tiles from GranitiFiandre Geologica collection, Granitech ventilated facade and raised floor become long-lasting structures that highlight the full body veining of these fine materials, together with extraordinary functional characteristics. GranitiFiandre tiles represent indeed the evolution in research and top technology applied to the most exclusive floor and wall covering materials. Where aesthetic element and performance must work together in the best combination to meet the requirements of the most demanding customers, Granitech will be therefore the most suitable choice.